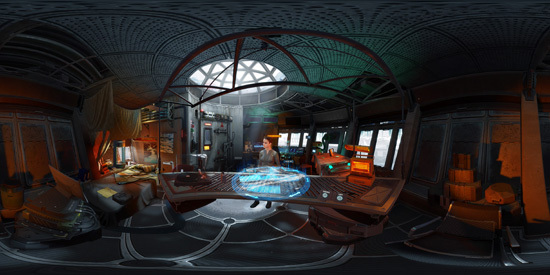 ARKTIKA.1 is a visceral VR first-person shooter powered by the acclaimed 4A Engine and built from the ground up for Oculus Touch. With breathtaking detail and superior shooting mechanics, ARKTIKA.1 offers unprecedented scope, storytelling, and graphical fidelity in a VR first-person shooter. Weapons in ARKTIKA.1 share a modular design. You can assemble unique variants by mixing and matching accessories on top of basic “frames”: antiques, railguns – and even weapons able to shoot around corners! It’s important to choose the right tool for the job: Horrifying creatures and violent offenders who once lurked outside the city walls have found a way in, and they’ll do whatever it takes to eliminate Citadel Security and anyone who lives in the colony. Immersive FPS action with full-body shooting mechanics. Engaging combat featuring unique abilities such as touch, dodge and hide. Some of the most impressive visuals ever seen in VR, thanks to the 4A Engine. Intuitive controls for natural, realistic gameplay. Atmospheric settings with a blend of post-apocalyptic and futuristic environments. Advanced weapons with plenty of customization choices to suit your personal playstyle. Visceral challenge with finely-tuned difficulty balance. Cloud Save functionality retains your save files so that you can play from any PC. Available initially in English, Russian, and Ukrainian – and now French, German, and Spanish! PRICING: ARKTIKA.1 is available on Oculus Rift for $29.99.